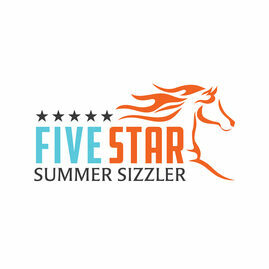 The Five Star Summer Sizzler is in its 5th year of promoting the fast-paced, exciting and growing sport of barrel racing in Manitoba. Our event is held on August 4th bringing in over 80 riders and spectators from Western Manitoba and Eastern Saskatchewan. Five Star proudly presents our yearly money added jackpot! $2000 added money! Entries are now open. Pre-entry is greatly appreciated. Entries the day of will be placed on bottom of draw. INCLUDE: your name, horses name, categories to enter, and an email address. Results and awards will be 30 mins after jackpot. Payout will be by etransfer. Prizes for first in each D! Bring the family! Kids activities, beverage tent, canteen, chuck wagon racing, beach volley ball, slow pitch, and so much more! !